This year we are offering exhibitor freight services for the Power-Gen International show in Orlando, FL. We are planning to have freight supervison on site to assist with any shipping issues or concerns. The advance warehouse opens on October 31st. through November 26th. This show has a targeted move-in from starting on December 4th through the 6th. If you would like a shipping quote please click the link below. What is an Added Value Service? TLC-Expo is a freight broker specializing in shipping trade show properties. TLC-Expo does not own any line-haul tractors or trailers, storage warehouses or forklifts. We only have great relationships with carriers and fellow freight brokers that are savvy in trade show transportation. We have been doing trade show exhibit transportation for over 40 years. The core of our business is to service exhibitors in shipping their exhibit properties in and out of the convention venue. It's often not as simple as just calling a freight company to book a shipment. There is a myriad of critical details to consider and manage. What value do we add? A personal contact that you can call day or night, weekends and holidays to answer your questions. Our customers have our mobile phone numbers! Attention to details on complex shipments with multiple stops and critical deadlines. Use of carriers and drivers that have trade show experience understand the procedures at marshaling yards and advance warehouses. Accurate quoting to help you budget and one invoice that summarizes multiple loads and round-trips. We provide out customers with color coded shipping labels for their crates and skids as well as bills of lading when necessary. 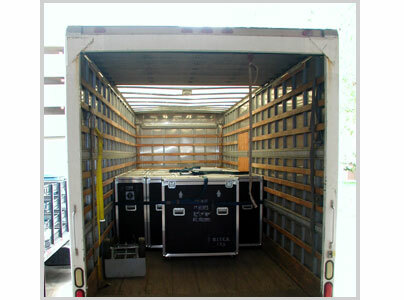 On-site freight supervision at the venue to assure that complex shipments are properly loaded or unloaded. Assistance on management of damage claims. Accurate assessment and management of waiting time incurred by drivers. Often can be minimized by proper scheduling. We are often at the shows assisting drivers getting checked in at the marshaling yards, making sure paperwork is turned in accurate and timely, manage (and hopefully prevent) damage claims and to just be helpful when we can. Knowing the in's and out's of the freight business is one thing, trade show shipping is a unique specialty that we do exclusively and expertly. There is one huge looming deadline that comes just before the trade show. It's when the truck arrives to pickup your exhibit properties and show materials. Of course, this shipment is very time sensitive and absolutely must deliver to the show on schedule. Besides all of the things that can go wrong once the shipment has left your own docks, what's worse than incurring additional costs because the shipment wasn't ready when the driver arrived. At TLC-Expo we offer our experience and expertise and coach our customers as to the best way to prepare there shipment. We provide the necessary labels, the shipping paperwork and we also make sure that the carrier and driver are on the same team. This initial preparation will save money, time and very costly mishaps.